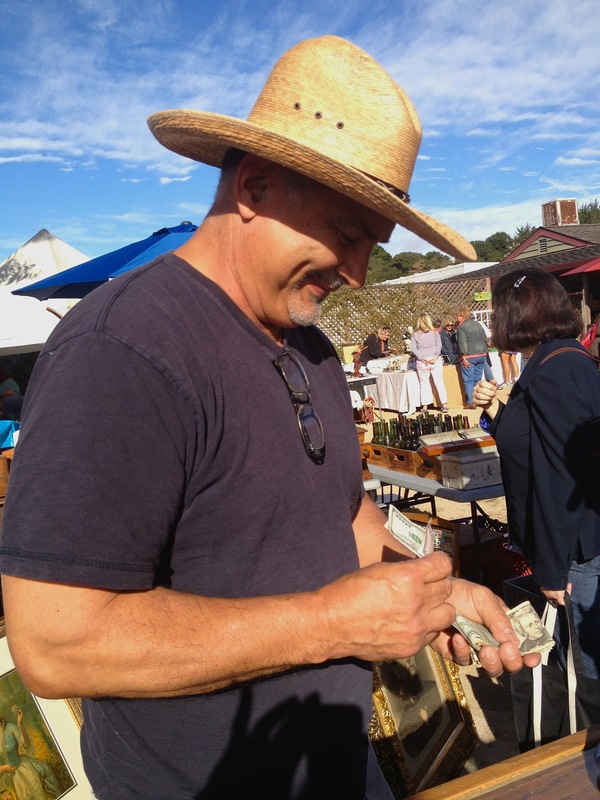 Rain was the last thing I expected on a September morning in Carmel, but there it was, threatening the little antique faire being held at Earthbound Farms organic stand in Carmel Valley. I should not have even given it a thought, as these are die-hard faire vendors who had set up beneath little white tents dripping with water, as they merely wiped the rain off their goods. The setting was spectacular. 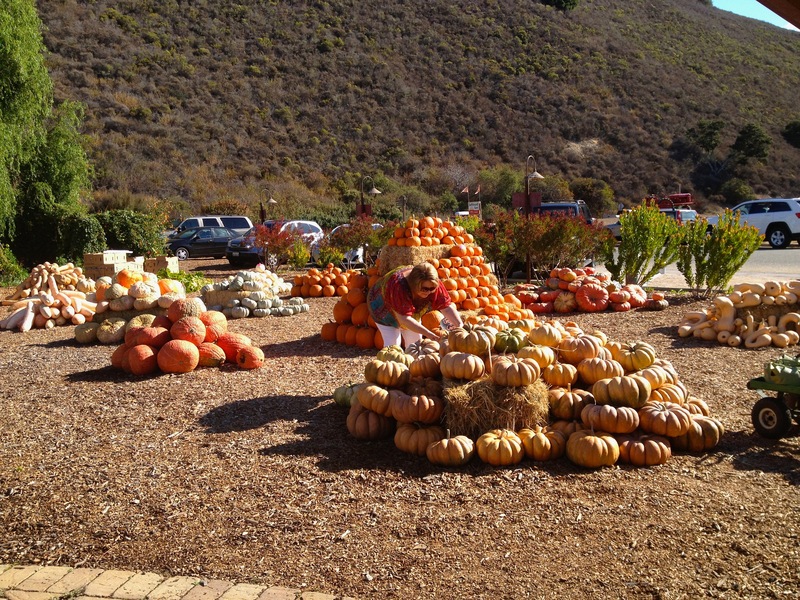 Piles of rare and varied pumpkins being offered for sale as gardeners raked and tidied the grounds, reminding us of the upcoming Halloween and Harvest season. 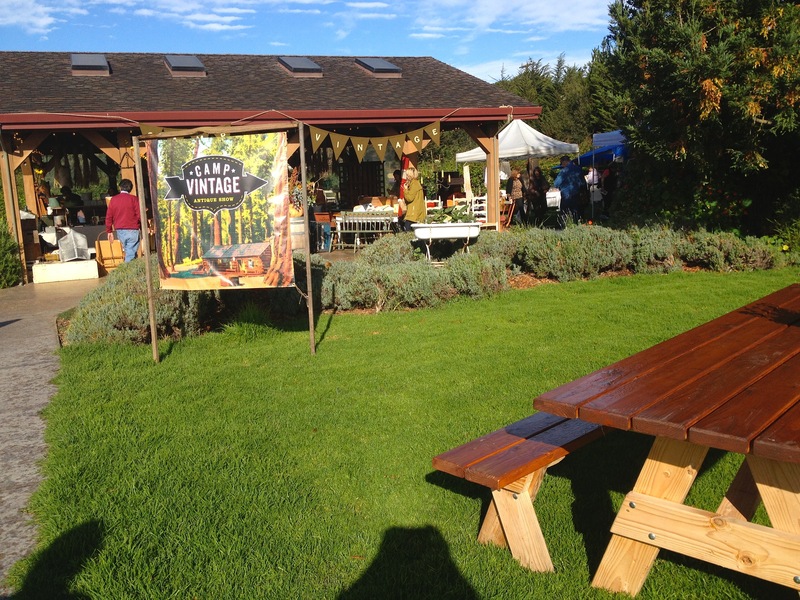 The theme was Camp Vintage, which brought out charming camp collectibles, Smokey the Bear, woolen blankets, old coolers and weathered thermos bottles. My first purchase was a bag of twelve tiny tins used for camera film, in colors of orange and yellow. This vendor also had great military ironstone cups with Navy logos on each. Almost tempted to buy, but decided to move on, while promising her I would return. This show brought about some super talented jewelry designers. A graduate gemologist, Alice Riordan displayed her fine gemstones set in precious metals and I particularly liked a silver bracelet fashioned from an antique spoon with a fish priced at $150. I passed up on the beautiful fish bracelet but purchased from Alice, an oil painting for $10. I am so drawn to swap meet and antique faire paintings. They are sometimes signed and sometimes not. But it’s their rough, unfinished sense that appeals to me, and I often wonder who was the artist and how did it find it’s way to a sale, unwanted and homeless. Another artist had playful leather bands adorned with vintage found objects. I was immediately attracted to a tooled leather piece with an old yellow Crown Cola bottle cap sitting on a silver etched concha. It was totally my look, so I handed Jackie Hicks, a most talented and kitchy designer, $30 for the wristband. 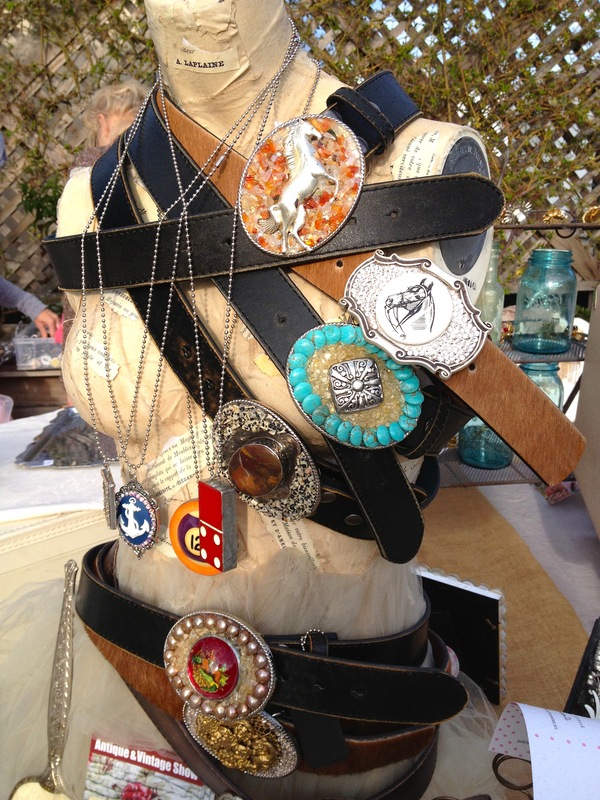 Her other pieces included vintage tape-measure necklaces with dangling metal antiques and wonderful belts in similar treatment. One of my favorite dealers in Monterey was showing. Larry Chavez is the proprietor of Monterey Rock and Roll Experience, a shop I am anxious to visit as he specializes in “all things rock ‘n roll.” His merchandise today is ranging from guy’s stuff to fun stuff, and it’s always a pleasure to talk to him. As the sun has just broken through, the crowds thicken. There are lines out the door of the organic store, as families are placing pink tape on their select pumpkins. 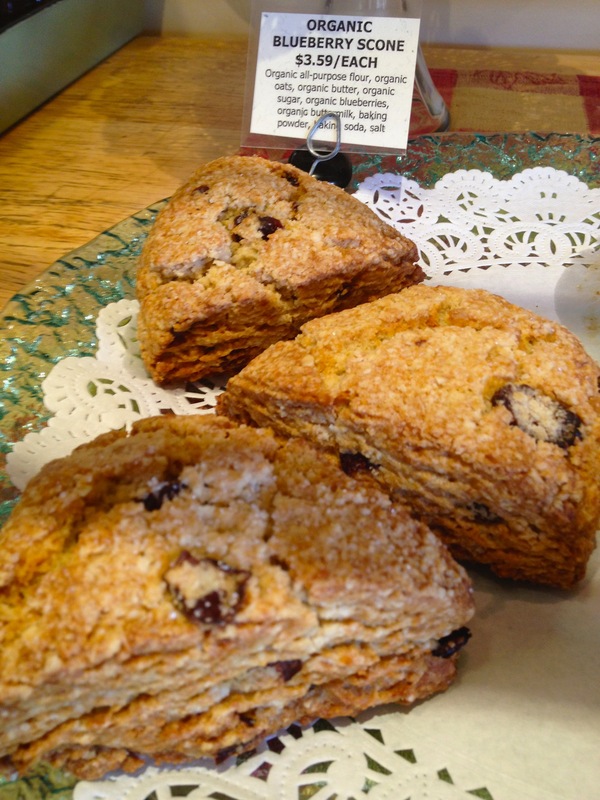 Walking into Earthbound Farms small store, the aroma of hot coffee and freshly baked organic scones smell so fragrant, so I give in and sit outside on the wooden tables set in the lawn overlooking the pumpkin piles, sipping coffee while stuffing a scone into my mouth. 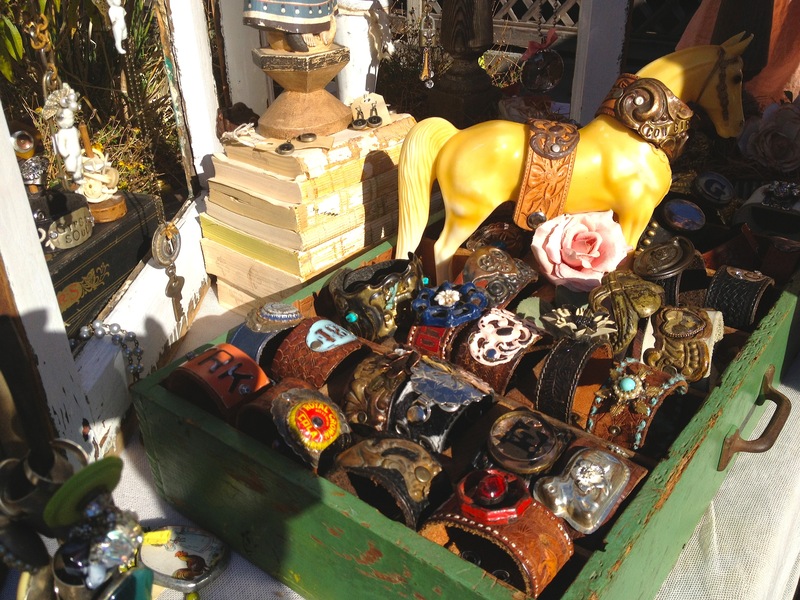 Just when you’ve gone through about fourteen vendors, there, on the opposite side of the organic stand, are seven more fabulous dealers with “camp” collectibles, weathered wooden furniture, pastel woolen blankets and songsheet-accordian-folded lampshades. An aqua woolen blanket with old satin borders catches my eye, as the dealer and I unfold it to check for mothbites. It is perfect. She also has the most amazing oil painting of a dark-haired Evita Peron’ type which was signed and dated 1930. We negotiate a bit and finally settle on $60 for both. The painting will not be for resale. I feel about it a lot like I feel about my books. These go into my private collection, as I love owning great books and great art. As in every sale or faire I attend, somehow, subconsciously, I am color-coordinating my purchases. Today the color is aqua. My favorite aqua purchase is four old woven wood chairs with a trace of faded aqua paint. From another vendor I spot an iron display stand also in that wonderful coastal color, so it is added to my pile. Funny, the color for the day should have been orange. I couldn’t leave without purchasing something leather, so I find an incredible heavy leather tote covered in travel stickers and a brown leather camera bag. I feel better now. 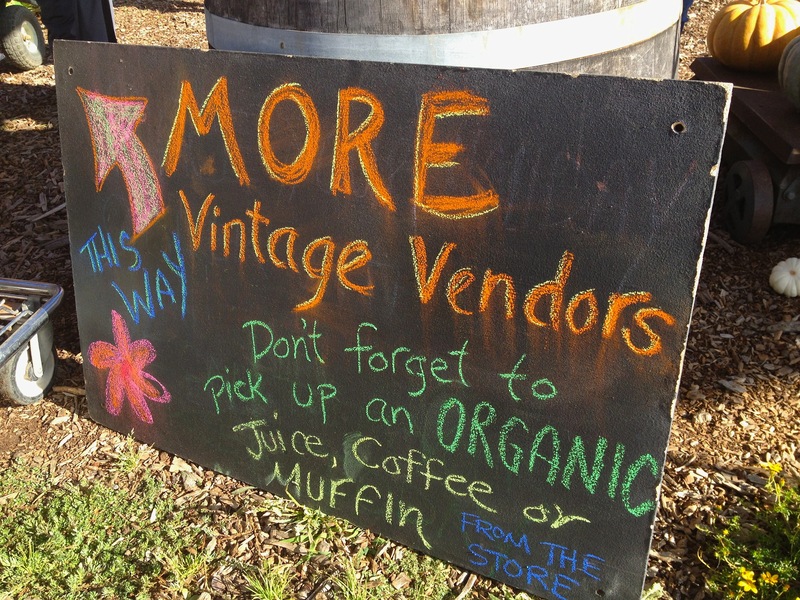 This is Camp Vintage’s first antique sale, and it’s a perfect fit to bring in the harvest season. 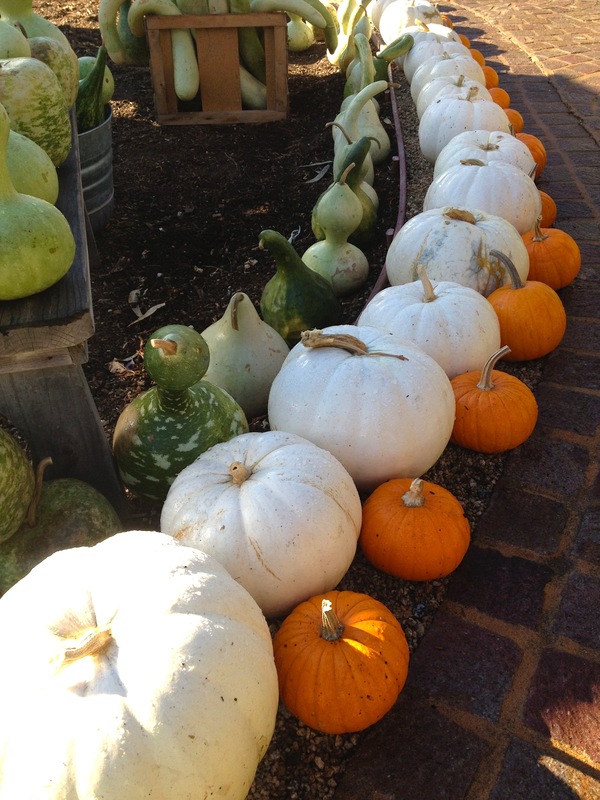 The setting couldn’t be more festive, as you enter through manicured dirt roads, surrounded by organic crops everywhere. There’s even an old green John Deere tractor on property. I leave with my Rover stuffed with great finds and make a mental note to mark this faire a “must attend” for next year, as it is a perfect kick-off in welcoming Fall.